Thanks for visiting Audiko.net! 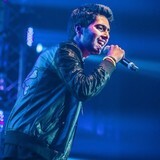 Use an opportunity to download a free Armaan Malik ringtones for your iPhone or mobile. Fix your favorite snippet from your favorite tune - JEENA JEENA - ARMAAN MALIK, I LOVE YOU, O Re Piya Cover, or any other track. On Audiko you can obtain your tune both in the MP3 and m4a formats, compatible with both mobile phones and iPhones. Just select a track, and choose free Armaan Malik ringtones download option.